I received this CD quite by surprise. By surprise because it came with others I was expecting but as something of an unrequested ‘bonus’. I was at first alarmed. French baroque music is not an area where I would pretend to be most knowledgeable. Give me Caldara, Vivaldi, Stradella or Geminiani from Italy and I am quite comfortable. But give me Lully, Couperin and Rameau and I am on slightly less familiar ground. I looked at the title. Pièces de Violes the label proudly boasted. I don’t know very much about viol music. Any apprehensions I might have felt quickly dissipated on listening to this beautiful disc. I hadn’t come across these Finnish musicians before but was immediately struck by the musicianship and spontaneity of the performances. The performers also have an excellent sense of the French baroque style and this was an experience I very much enjoyed from beginning to end and I can heartily recommend this issue in every way. It was only in the latter part of his life that Couperin published instrumental chamber music to any extent. Before this his output had been largely for the keyboard – the music for which he is most celebrated today. Written as late as 1728, the two suites comprising the Pièces de violes represent the end of the by now tentative hold that the viols had as viable instruments following the onslaught of the relatively new-fangled violin family. The first Pièce de viole is a large-scale baroque suite comprising a Prélude and six stylised dance movements popular at the time. Throughout, the viols play unequal roles – the first instrument having the entire melodic interest while the second is firmly in the role of a continuo instrument. The second suite immediately presents a different aspect to Couperin’s writing. Much more concise in construction – only four movements here – the two viols are immediately presented contrapuntally, one imitating the other in a much more equitable way. The centrepiece of this second suite is the eight-minute Pompe funèbre third movement. The Nouveaux concerts or Goûts-réunis was the second part of a series of fourteen pieces, designed for performance in front of the French king, for unspecified instruments with continuo. Several of these have appeared on CD before in numerous recordings on a variety of instruments. The only concert in which Couperin does mention unambiguous instruments is the twelfth, where he expressly specifies two viols. Goûts-réunis translates roughly as ‘unified tastes’ and was Couperin’s attempt at combining and reconciling aspects of the French and Italian writing styles of the time. Each of the concerts presented here comprises a suite of four movements; a very short Prélude serving as little more than an introduction to the air or dance movement that follows it. The second viol largely acts as a continuo instrument in the 10ème concert but is very much the duo partner in the 12ème and 13ème concerts, where Couperin calls for just two instruments à l’unisson (ie alone without keyboard). The French baroque pitch used here is very low at A=392 Hz, so everything sounds approximately a tone lower than it appears on paper and uses French tempérament ordinaire, which lies somewhere between mean-tone temperament - which does not facilitate straying into sharp and flat keys without keyboard instruments experiencing some startling tuning difficulties – and our modern equal temperament. 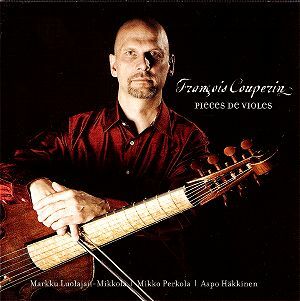 For period-instrument enthusiasts, both viols used in this recording are seven-stringed copies of late seventeenth/early eighteenth-century French originals with Dutch Carrington bows. The harpsichord is a recent reproduction of a mid-eighteenth-century French instrument by Pascal Taskin. The AVIE recording here is first class, with the balance between instruments natural and perfectly judged. Some might find the acoustic of the fifteenth-century church in Karjaa in south-west Finland, between Turku and Helsinki, a shade too reverberant but for me it suited the nature of the music faultlessly. What did distract me, however, was some of the heavy breathing of the performers caught on microphone. I would have preferred a little more detail about the music and its origins and function from the booklet note writer Eero Hämeeniemi but the information is adequate.